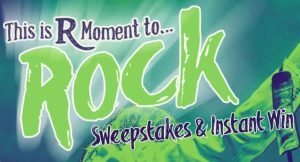 Enter for your chance to win one of 3 grand prizes or Instant Win Game Prizes! One (1) Tickets for a Year Grand Prize consisting of two (2) Ticketmaster® Gift Card that equal three thousand dollars ($3,000; “Gift Card”). ARV of Tickets for a Year Grand Prize is: Three Thousand Dollars and No Cents ($3000.00). One (1) Trip to Italy Grand Prize consisting of trip to Italy for winner and one (1) guest to tour Sponsor’s Riunite winery (“Italy Grand Prize”). In connection with the Italy Grand Prize Live Nation will provide round-trip, coach class air transportation for two (2) from the major airport nearest grand prize winner’s home within the U.S. to the major airport nearest the Riunite winery in Italy; one (1) double occupancy standard hotel room for 5 nights/6 days; and a $500.00 pre-paid cash card to use toward ground transportation. ARV of the Trip to Italy Grand Prize is: Six Thousand Dollars and No Cents ($6,000.00).